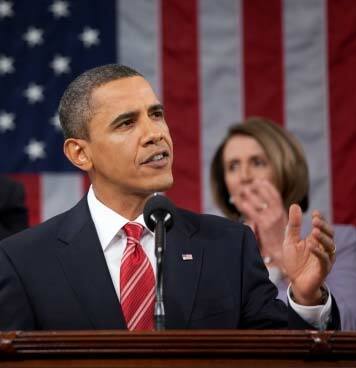 State of the Union Speech: Where is the Change? Although many people have given high marks to President Obama for his State of the Union speech, I think he failed to offer much change from many of former President George W. Bush’s failed policies. Perhaps Obama’s most important lack of change was his continuing Bush’s treatment of the banks and Wall Street. The Obama administration retained Ben Bernanke, the Bush appointee as head of the Federal Reserve, brought in Tim Geithner as Secretary of the Treasury and Larry Summers as the lead economic advisor. Geithner and Summers both have strong ties to Wall Street just as Henry Paulson, Bush’s Secretary of the Treasury. Bush’s huge gift to Wall Street grew even under Obama. Now many in the U.S. public associate Obama and the Democrats with these favors to Wall Street. The public also sees that Main Street is really suffering while the folks who created the disaster are benefiting tremendously from the bailouts. These parasites on Wall Street have retained the bailout money instead of putting it to work to help the real economy. People are really angry about this situation and Obama apparently doesn’t get it. Making matters worse for the Democrats, it is the Republicans who, through their opposition to Bernanke and Geithner, now appear as populists. Obama could have regained some credibility by admitting that adopting the Bush program was wrong. He could have disassociated himself from Wall Street by firing Summers and Geithner and withdrawing Bernanke’s reappointment. He didn’t and this bank bailout will now likely be an albatross for the Democrats heading into the November election. The levy Obama mentioned is indeed modest. It is roughly $90 billion to be paid over ten years, or an average of $9 billion a year. For comparison purposes, for 2009 the bank bonus pool for just the six biggest U.S. banks is on pace to be $150 billion. This sounds like Bush bragging about cutting taxes, although Bush’s cuts primarily benefited the wealthy. I strongly agree with how these tax cuts were targeted, but it seems as if Obama is supporting the Republican notion that taxes are bad. Instead of defending taxes as being crucial to a functioning civil society, he bragged about not raising taxes. Will this strategy backfire and make it harder to raise taxes or to change to a much more progressive tax program? Instead of this focus on cutting taxes, he could have pointed to Oregon where the voters had just approved tax increases on those with high incomes and on corporations. When voters understand the threat to public education and public services, they are more open to targeted tax increases. Starting in 2011, we are prepared to freeze government spending for three years. Spending related to our national security, Medicare, Medicaid, and Social Security will not be affected. But all other discretionary government programs will. It is amazing that several trillion dollars can go for a bank bailout and there is no concern about fiscal responsibility. The budget hawks only find their voice when programs might benefit the public. Many have advocated for a small fee on financial transactions to provide more stability to this sector as well as raising some funds for aiding the public as well as reducing the deficit. It would help if Obama were to strongly push this option as part of his reforms. Making matters worse, just like Bush, Obama seems to be treating military spending as a sacred cow that will be increased at the expense of programs that benefit the public good. He is proposing no increases in funds for education, for transportation, for social services, for national parks, etc. However, there will be no freeze in funding for the over 800 U.S. military installations in over 135 countries that support the U.S. empire. There will be no freeze in military weapons programs (corporate welfare to the military-industrial complex) or in the funding of private mercenary forces. Obama also targeted the three mandatory programs– Social Security, Medicare and Medicaid– for study by a commission that he created by executive order. These are three programs that really benefit the public. No other spending will be examined. Despite the widespread fraud in the terribly bloated military budget, it will be off limits for review. This position again echoes that of the Bush administration. A major emphasis of the speech was jobs. Unfortunately, the proposals offered seem too small to have much effect on unemployment. Despite conventional wisdom, the U.S. needs a large second stimulus without the ineffectual Republican-pushed tax cuts. The stimulus needs to target the rebuilding of the social and physical infrastructure as a way of providing living wage jobs. In addition, a part of the stimulus must be reserved for state and local governments in their attempts to help the struggling and suffering public in this time of crisis. It is amazing that he can totally ignore energy efficiency and energy conservation in addressing our need for energy. He went on to support the House bill passed last year that featured the ‘cap and trade’ approach as a way of reducing carbon dioxide emissions. This approach would likely cause more speculation and fraud as well as further enriching Wall Street. A direct tax on carbon dioxide emissions would likely be more effective and efficient. Obama also reiterated his support for healthcare reform. But if anyone from either party has a better approach that will bring down premiums, bring down the deficit, cover the uninsured, strengthen Medicare for seniors and stop insurance company abuses, let me know. Unfortunately, Obama consistently ignores the single-payer or Medicare for all approach that meets his criteria far better than the corporate welfare proposals passed by the House or Senate. The political theater over healthcare reform simply demonstrates the power of the health insurance and pharmaceutical lobbies. Obama also addressed the Supreme Court decision allowing corporations to further undermine any hint of democracy here. He made a weak statement asking Congress to address this issue. He could have come out strongly in support of public financing of campaigns. He could have pushed the FCC to require that television and radio provide a certain amount of prime-time airtime to candidates in return for their right to use the public airwaves. He didn’t advocate for either of these ideas. Obama didn’t say much on this important area. He has continued the Bush approach of treating the symptoms and not confronting the causes of terrorism. Both administrations have conflated nationalistic movements with international terrorists. The militaristic approach used by both administrations has simply increased the number of terrorists and turned much of the world against the U.S. Obama also echoes Bush in treating Iraq as a success story when it has been a major disaster and war crime of humongous proportions. One key step Obama must pursue is to work for a just peace between Israelis and Palestinians that is based on international law, human rights and justice. If he were to achieve this outcome, it would do wonders for the U.S. image worldwide. This material addresses a few, but clearly not all, of the key issues facing Obama and the U.S. in the next few years. Obama should remember what he recently said: “I’d rather be a really good one-term president than a mediocre two-term president.” To be a good president, he must pursue policies that represent Main Street, not Wall Street. If he does this, he can use his email list of 13 million and energize them to work with him. However, if he continues along the path he is currently following, he could be a mediocre one-term president and we could see a return of the Republican party to power.